Recently I have been building Finnish armor from the WWII period. The main Finnish tank at the outbreak of the WWII was the British Vickers "6 ton tank" armed with a Swedish Bofors 37 mm gun. During the war the Finns captured and pressed into service a substantial amount of Russian T-26 tanks, representing several different sub-types. No Finnish collection is complete without the Vickers, and as the most numerous war trophy (114 pcs) in Finnish use the T-26 is also an extremely important model from the Finnish point of view. The T-26 is almost a pure carbon copy of the Vickers, and so I decided to build both these types simultaneously, side by side, and do some part swapping during the process if necessary. I did not aim at 100 per cent accuracy, but tried to reproduce reasonably convincing replicas of the original vehicles. Therefore I did not hunt down and correct all possible deviations from the forms and dimensions of the actual tanks. The Polish firm Mirage has rapidly gained reputation with their quality line of Vickers and T-26 variants, and their kits are indeed very good. 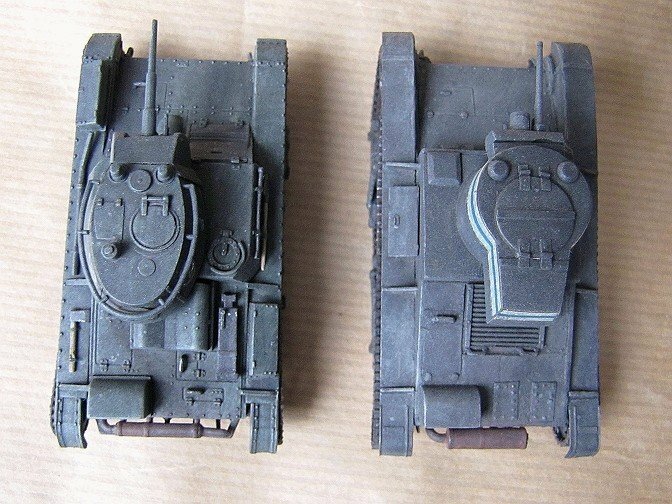 Also the now foregone Ukrainian firm Skif produced several T-26 kits, which are now marketed under UM label with original etch parts replaced by new injection molded ones. 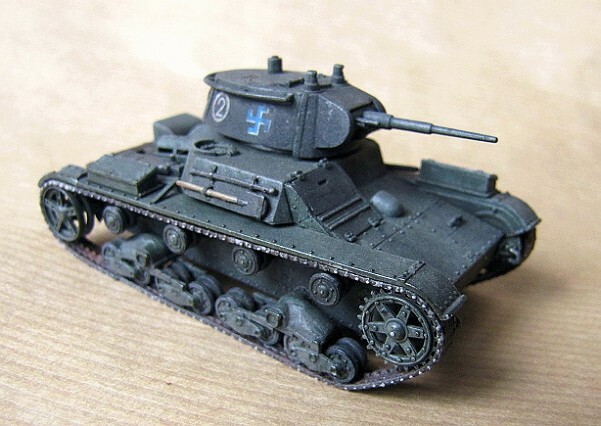 Most of the existing kits are passable as a Finnish T-26, but none of them is directly eligible as a Finnish Vickers. Since Vickers and T-26 are close relatives, I wanted to emphasise their differences, and chose different kits to base them on. Therefore my models are made of the kits of different manufacturers portraying different evolution models. 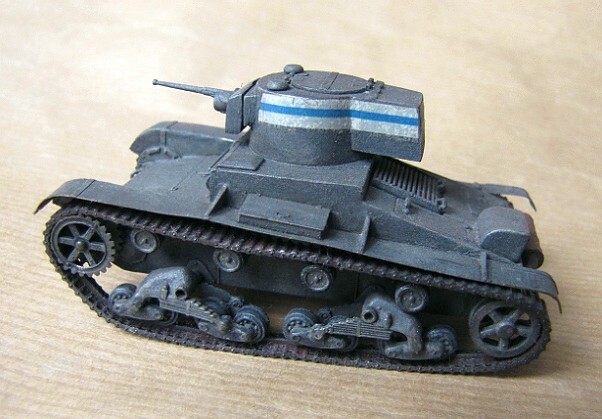 The Vickers is converted from the T-26B model 33 by Skif, and a later sub-type T-26C is built almost out of the box from the "Finlandia ´45" kit by Mirage. The Mirage kit has a more complex and more detailed hull structure with all main panels molded as separate parts, and with their riveted appearance and other details finely displayed. While the molding is very clear and fine, there are some parts where there are small dents left by plastic shrinkage during cooling. The Skif kit, for its part, consists of far fewer, and marginally simpler pieces. The mudguards, drivers hatch cover, tool box-covers, engine grille and some braces and hooks are made of photo etch, adding a sense of finesse to this otherwise rather basic kit. There is one particular part where the Skif kit surpasses the Mirage detail-wise. This is the hull bottom  which on the finished kit is sadly hidden from the casual observer. The Skif turret is a cylindrical model 1933 turret with a possibility to mount an etched frame antenna. The overall appearance and detail level are quite sufficient, but the characteristic riveted structure is not at all displayed. The hatches are molded shut. 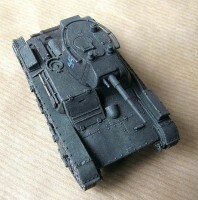 As I decided to convert the Skif kit to represent the original Vickers vehicle, the kit turret could not be used. The later model 1937 conical turret of Mirage comes with two optional mantlets, but there is an error concerning the provided Finnish armament - the kit is equipped with a thin 37 mm barrel, but no such gun ever existed on Finnish T-26s. In reality these weapons were only used with some of the British Vickers tanks and all captured T-26 tanks and also the older Vickers tanks were armed in 1940 and 1941 with heavier Russian 45 mm guns. Mirage turret is very nicely shaped and detailed with open hatches, but the aft escape hatch is completely omitted (this was not present on all variants). The Finnish variant includes a circular hand-railing to be added around the turret. This, I believe, was an original Russian installation although the kit instructions tell it was a Finnish add-on. Both kits have very complex, multi-part bogie wheel assemblies, the Skif even more so. The details in this area are almost equally good in both kits, but the Mirage manages slightly better. Skif uses photo etch in the sprocket wheels, which is a nice touch. The tracks are made of rubber in both sets. The Skif tracks are continuous loops with an annoying ridge in the place of the guiding teeth and with fairly basic detail. Mirage provides conventional one-piece tracks that need to be joined at the ends. The material is thin, quite elastic and has reasonably good details on both sides. 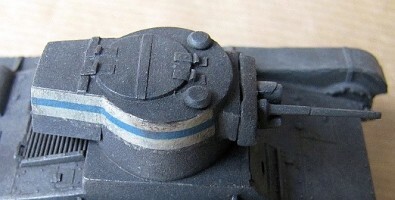 However, there are rather prominent ejector marks on the inside of the tracks. The Skif comes with a wide selection of markings for Russian, Spanish nationalist and Finnish vehicles. The printing is nice and clear and the film is very thin. The decal sheet of the Mirage kit is faultless quality-wise, but it only covers two blue swastikas as Finnish national insignia, while vehicle registration numbers and tactical markings are completely absent. The main challenge in converting a T-26 into a Vickers 6 ton tank lies in reproducing the turret. The hull dimensions and shapes between the two are very similar, and the wheel assemblies are practically identical. I did not do too precise measurements, but relied on bare eyesight, rough ruler measures and a few photographs. I started by sawing the engine deck plate off the hull, and tilted it to a steeper angle, and heightened the rear side walls accordingly. The fighting compartment should have been slightly lengthened during the process, and the engine deck correspondingly shortened, but I noticed this too late to change it. I also sanded the details off the deck and planted two makeshift hatches made of foil on top of it. I also added a couple of handles. Then I shaved off the Russian-type small hatch on the rear top corner of the fighting compartment and planted a rectangular "bump" on the opposite corner (taken from the Mirage kit) and a scratched smg mount on the glacis. The hollow etched mudguard braces were substituted by solid plastic bits. There were no major problems in putting together the hull, but anticipating problems stemming from the rigid rubber tracks, I planted heavy weights inside the hull. This proved to be a good decision. Several hooks are provided in photoetch by Skif, but although they are pre-marked for bending to shape, many of them broke at the angles and could not be used. The turret is completely scratch built. The basic shape was made of plastic sheet rolled and glued into conical shape and sanded into correct height. The rear extension was made of plastic sheet, as was the turret hatch. The hinges were made of foil and the roof ventilation cones were confiscated from the Mirage kit. The mantlet was constructed of plastic beams and rod sanded into shape, while the gun itself is the erroneous Mirage offering (cal. 37 mm), its barrel somewhat shortened. I did not carve the side vision slits, and neither did I carve slits on the hull sides. After figuring out how to approach the turret construction there were no particular problems, but without good photographic overview of the top of the turret I ended up making the hatch too wide. 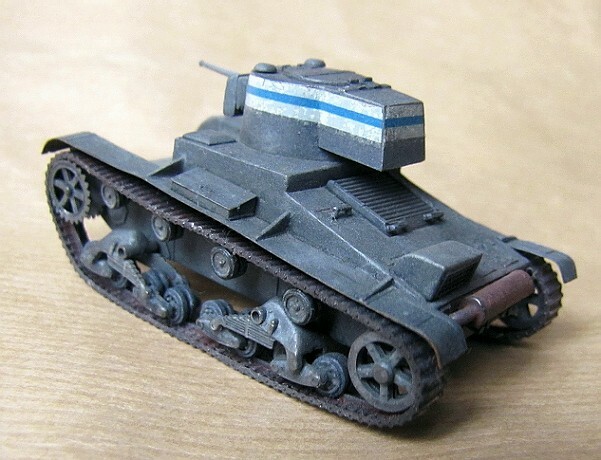 The real Vickers was put together by rivets, which defines its appearance quite a bit. The Skif kit sports no rivets, and as I did not care to reproduce them, my Vickers ended being definitely too "smooth". The wheel assembly was one of the most laborious I have ever encountered. The multitude of parts and the sheer smallness of many of them, coupled with the fact that there was very little surface for the glue to stick to, made the effort physically almost impossible. The fit of the suspension unit halves was also far from perfect, although this could have been the result of the overly thick bogie wheel pairs and avoided by more careful dry fitting. All in all the result of this construction sequence was two broken leaf springs, somewhat skewed bogie assemblies held together with heavy doses of super glue, accompanied with several curse words. The tracks are not among the most detailed I have seen, but due to their interesting loop design, they were easy to put on and actually do their job adequately. During the installation phase one third of the sprocket wheel teeth had to be cut off to ensure a fit on the tracks. As these are made of quite thick brass, it was a good idea to leave them unglued until the tracks were ready to be added. The hull was easy to put together, but it required some care, since the top panels are slid, not planted into their position. The only major fit problem was in the area of the drivers hatch, which is clearly too short and fits poorly to its frame without lengthening and adjusting. Also it would be wise to fill up the bottoms of the widened, overhanging sides of the fighting compartment, otherwise they can be seen through at certain angles. The turret was built straight from the box, except for the gun that was of a wrong calibre. 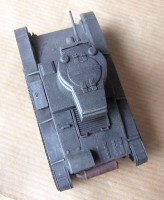 Instead, a 45 mm barrel with its mount taken from the Unimodel BT-5 kit was used. It did fit well enough after some cutting and sanding. The fit of the turret front section was loose, and required some filling. A round escape hatch on the turret rear was made of foil and added. The wheels, especially the bogies were - again - quite difficult to work with. Due to their miniscule size it is really too easy to misplace and lose the tiny road wheels forever, but luckily there seem to be a few reserve wheels on the sprues! Compared with the Skif bogies these were a bit nicer to build, easier to align and their fit was better. The appearance of the leaf springs is somewhat more "anemic" than is the case with the Skifs suspension units, but this in fact might be a bit more realistic. The tracks are thin, almost too thin, but easy to apply and look good installed. 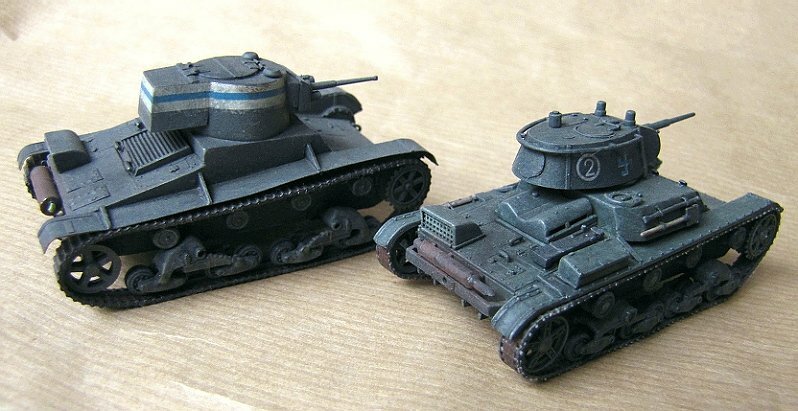 The posture of the tank with the road wheels and tracks assembled seems quite low and "squat", especially if the Skif and Mirage model are presented side by side. I have not measured the height of the two models, but it indeed seems to me as if it would be the Mirage kit that sits too low. The Mirage kit comes with a wide selection of accessories and tools, and in this area it beats the Skif kit easily. I added most of the tools with support braces made of foil, and while doing this it became evident that there is not enough space for all of them in the locations where the instructions have them placed. The modular production style of the kit ensures that there will be several spare parts left after the assembly is done. The Vickers tanks were used in Finland sporting the British Bronze green painting. 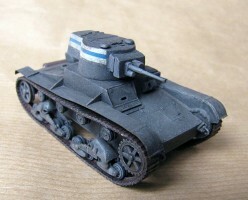 In 1943 the surviving, and by then up-gunned tanks were painted with the new three-tone camouflage. I wanted mine to represent the 1939-40 Winter War period, so I went on with the one-colour scheme. The paint I chose to reproduce this was Tamiya Khaki Drab (XF-51). After highlighting, washes and weathering it was time for some decals. During the Winter War Finnish tanks were marked with white-blue-white stripes around the top of the turret. These were soon abandoned on the grounds of being too prominent. I thought a while about painting these, but luckily I found a passable decal stripe on an old car model sheet. I cut it into sections, applied them and thus was the Vickers marked. A sorry thing is that the tapering shape of the turret did not accept the straight identification stripes perfectly. The Skif kit has a remarkably nice and comprehensive decal sheet, but none of it was usable in the context of this project. The Finnish T-26s were usually assigned to troops in their original colouring with just the national insignias over-painted. Only in relation with bigger repairs were they painted according to Finnish standards. In wintertime conditions a white over-paint could also be applied. I decided to portray a vehicle in the pre-three-color standard, around autumn 1941, and as a Russian green in this case I used Tamiya Olive Green (XF-58). My painting decision also allowed bending the Finnish marking rules. 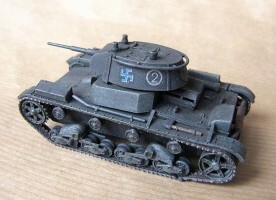 As it happens, the kit comes with blue hakaristi for national insignia, but in reality these were rather rare and used only in 1941, being usually black and beginning from winter of 1941-42 explicitly so. As an example from an era of not very standardised armor markings, I actually did accept the blue markings, partly because they were very finely executed. I complemented them with tactical number "2" markings from the Skif sheet, although I have no evidence that this particular combination of vehicle type, painting and tactical markings ever actually existed. There is a commonly shared understanding that the Mirage T-26 series is superior to the corresponding Skif/UM product. While I basically agree with this conception, there are a several good points about the T-26 model by Skif/UM, too, and it should not be too hastily overlooked on other grounds but possibly its tracks. I think the value of this kit in its original layout is improved by the etched parts despite their relative crudeness, and the high quality decal sheet. The Mirage kit looks splendid in the box, and it was mostly a pleasure to build, and therefore it was a bit surprising that it in fact did have some fit problems. This experience, however, encourages me to follow the future releases by this Polish manufacturer with a keen eye.